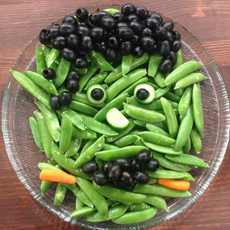 Want a healthy alternative to traditional Halloween fare? 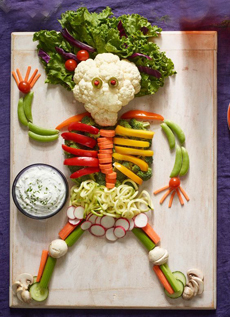 Turn raw veggies—crudités to foodies—into a creative Halloween platter designed in the shape of Frankenstein, a jack o’lantern, owl, skeleton, scary cat, spider or witch. Believe us, these will enchant the adults as well as the kids. 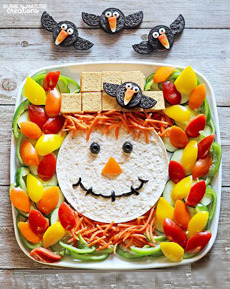 If you don’t want to make a shape, ForkAndBeans.com created a Creepy Crudités platter by Halloween-ing the vegetables themselves: carrot witch’s fingers, cauliflower brains, cucumber eyeballs, tortilla chip tombstones. These ideas and more come from a simple Pinterest search. This cheese dip mummy was created by Phyllis Hoffman at Celebrate magazine, as posted on Blog.HWTM.com. It’s not kid stuff: with goat cheese, capers and two different types of olives, it’s sophisticated fare. 1. BEAT 1 package cream cheese and the goat cheese in a medium bowl with an electric mixer. Beat at medium speed until smooth. 2. ADD the olives, capers, garlic and pepper, beating until combined. Refrigerate the mixture for a least 1 hour; then place the firmed dip on a serving plate and form it into a mummy shape. 3. BEAT the remaining cream cheese at medium speed until smooth. Place the cream cheese in a pastry bag fitted with a flat leaf tip. Pipe the mummy “bandages” onto the mummy figure. Refrigerate until ready to serve with the vegetables and the optional crackers. What to serve with the creepy crudités? Orange or red dip, of course! If you’re not a hummus fan, there are options like this carrot and white bean dip. This recipe is not hummus: Although it does use tahini, there are no chickpeas. Alternatively, you can add the pureed beets to hummus. With either technique, if it isn’t “bloody” enough for you, add a drop of red food color. Because Halloween is a busy time, we used canned beets. We’ll roast our own for Thanksgiving. Invite Frankenstein to the party (photo and recipe from TheProduceMom.com). Skeletal and vegetal: There are numerous scarecrow designs on Pinterest (photo courtesy Woman’s Day). The scarecrow face is made from a tortilla. You can turn this design into individual cheese-and-vegetable or salad plates (photo courtesy ItsWrittenOnTheWall.com). 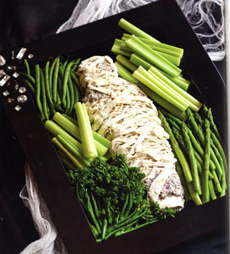 Think of this mummy as a cheese ball with a flatter shape (photo courtesy Celebrate magazine. If you don’t have an appropriate serving plate, get a black plastic platter from a party store. 1. DRAIN the beets. You can reserve the beet juice for beverages, red mashed potatoes, and other uses. 2. BLEND all ingredients in a food processor until smooth (or chunky, as you prefer). If the dip isn’t thin enough, you can add some water, one tablespoon at a time as needed (we’ve also used orange juice). 3. TASTE and adjust seasonings. The canned beets juice is typically salted, so you may not need more salt.